A Wal-Mart store in Ohio puts out donation bins for their own workers. This isn't a merchandise display. It's a food drive - not for the community, but for needy workers. The biggest hardship Wal-Mart employees face is too often the sight of their paycheck. 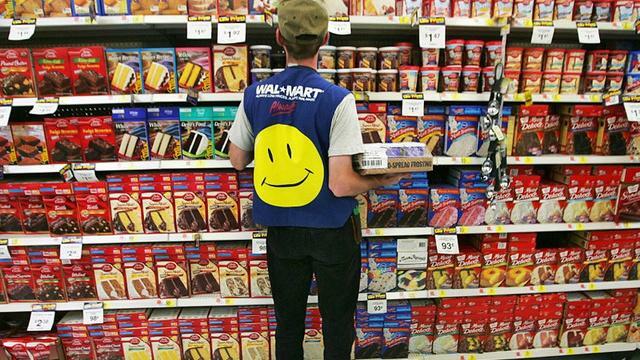 By Wal-Mart's own calculations, nearly two-thirds of its employees make less than $25K a year. Wal-Mart wages are so low, that many of its employees are forced to seek government assistance to make ends meet: a recent study in Wisconsin found that a single 300-employee store costs taxpayers roughly $1 million in individual subsidies -- in food stamps, housing assistance, child care assistance, etc. -- each year. Or maybe their worst hardship is the actual work conditions. In 2005, Wal-Mart was found to have denied workers lunch breaks and overtime pay, and a few weeks ago, a Rochester store was fined by OSHA for having more than 100 violations of health and safety regulations, citing the store for failing to train employees how to handle hazardous waste and blocking emergency exits in the store. Wal-Mart was also the target of the largest class-action discrimination lawsuit in history, filed on behalf of 1.5 million women and former Wal-Mart employees, who sued the store for favoring men with promotions and pay. The suit was dismissed by the Supreme Court, not on the merits of the case, but because the court's conservative justices thought too many women were discriminated against and the discrimination too pervasive, they found the case not worth bothering with. Wal-Mart's also rabidly anti-union. The company has fired employees who have threatened to organize -- illegally, according the National Labor Relations Board. The food bins, then, are merely symbolic of the plight of the company's workers. The company is making billions in profit, largely off of the work of its employees, little of which is going back to the workers. Meanwhile, because work conditions there are so bad and pay so low, taxpayers are force to underwrite the store's policies. "The company needs to stand up and give them their 40 hours and a living wage, so they don't have to worry about whether they can afford Thanksgiving."